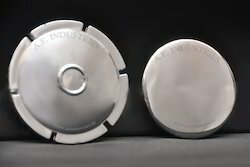 This model starter motor cover is suitable for Royal Enfield Bullets Classic 350 CC and ELECTRA 350 CC. The said cover starter motors are in our regular production and are supplying to Royal Enfield factories located in Chennai and in Oragadam. Finish of the cover is attractive chrome plated on ABS Plastic with Royal Enfield logo.Custom finish in plating is also available on requirement. 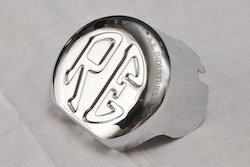 This chrome plated cover is fitted in all the 350 model bullets and we are the single vendor for the manufacturing and supplying for this product to Royal Enfield. This is a old model Cover for Starter Motor and we are the one and only manufacturer for this product throughout the world also supplying to Royal Enfield OEM. The part is suitable for Thunderbird old models and the finish is attractive Chrome plated with ROYAL ENFIELD logo. At present production for this old model was stopped but still procuring by Royal Enfield spare parts division to cater to their after sales market and the product is available only with us throughout the globe. 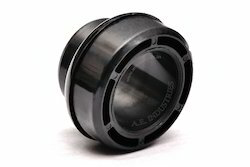 This product is a CAP for SWING PIVOT and is in our regular supply to both the plants of Royal Enfield in Chennai and Oragadam. These are suitable for Bullet 500CC,350CC of all models of Classic,Electra and Thunder bird. Finish of the part is attractive chrome plated and custom colur is also available on demand. This part is madeup of Nylon and is used in fork of bullets of Royal Enfield make.This product is a replacement for metal bush and is cheaper,light weight,and proven in strength and in fittment of bullets. This is the one used in all bullets by the factory as a alternate for metal bushes. 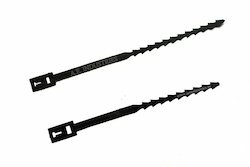 The picture shows the cable strap or cable tie in 6" and 8" length which is widely used in bundelling all the wiring parts in a bullet. It is made up of plastic alloy material to withstand the load and tightness of the bundle of wires.Normally it is in black colour and custom colour is also available on demand. 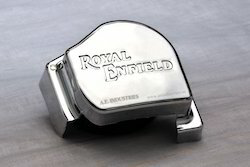 Looking for ROYAL ENFIELD BULLET PARTS ?